No, that’s not him above. But Chef Guillaume Bienaime does bear more than a passing resemblance to the Alfredo Linguine character from the movie, “Ratatouille,” especially with the glasses drawn on. 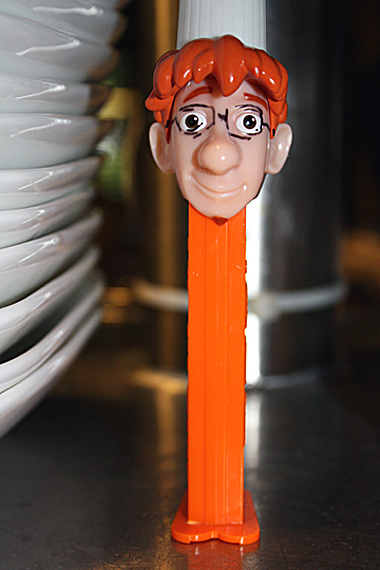 You have to love a chef with the playfulness to keep a Pez dispenser like this on a shelf in his bustling professional kitchen. Below is the real Bienaime, executive chef of Marché restaurant in Menlo Park. And believe me, he doesn’t need a cute talking rat named Remi or anyone else to help him do his job. This 27-year-old chef is a talent, and a giving one at that. Last Sunday, on what was supposed to be his day off when the restaurant is normally closed, he decided instead to teach his first cooking class. Marché opened its doors that morning to 16 eager students — most of them regular diners at the restaurant — as well as yours truly and the chef’s Mom to partake in what was the first of four seasonal cooking classes planned annually. And believe me, you will not leave hungry from this $105 class. We met up with the chef at the nearby Menlo Park farmers market to help gather peppers, corn, peaches, squash, and tomatoes for the dishes we would cook back at the restaurant. 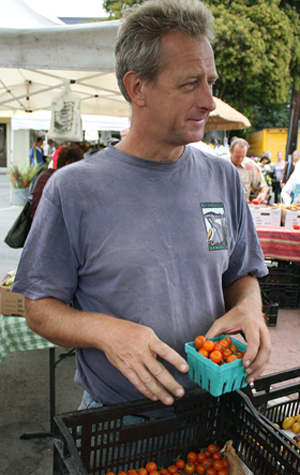 Marché gets all its tomatoes from Baia Nicchia Farm in Sunol, which sells at the Sunday farmers market. Owner Fred Hempel, a geneticist, owns 9 1/2 acres where he grows 30 types of tomatoes, half of them varieties he has created, himself. 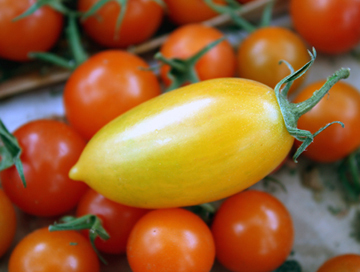 Indeed, Chef Bienaime is working with Hempel to create a signature “Marché” tomato, resulting from cross-breeding a couple varieties together. It will take two years of tinkering before the tomato will be ready to be grown for the restaurant. 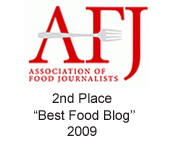 We carried the provisions back to the restaurant, where we divided up into teams of two or three. The chef explained the dishes we could be cooking that day: Roast Pork Loin a` la Provencal, Summer Squash a` la Grecque, Confit Tomatoes, Summer Corn “Polenta,” Piperade Basquaise, Gratin of Swiss Chard, and Plum & Peach Shortcake. Chef Bienaime, though, had a special plan for my buddy, Carissa, and I. He was going to have us make Escargots Sommiéroise, a traditional dish from Saint-Guilhem Désert in the Langueduoc region, which is snail country. Neither Carissa nor I had ever cooked with snails before, so we were eager to give it a go. 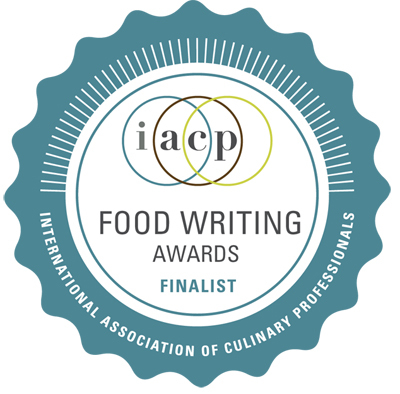 We all donned aprons and set to work in the restaurant’s gleaming stainless steel kitchen, grabbing knives, chinoises, copper pots, and food processors. And no, we didn’t escape doing dishes. But we didn’t mind, what with the restaurant’s nifty machine at our disposal. You rinsed off the dishes, piled them into a rack, and slid it all into the machine, where everything would emerge spotless in just three minutes. Why can’t we have one of these at home, we all thought! At Marché, the garlic is almost always grated into dishes, using a Micrcoplane, rather than chopped or sliced with a knife. Bienaime says he likes how the garlic disappears into a dish this way. Skin on bell peppers is always peeled off, too, even if they are not roasted. 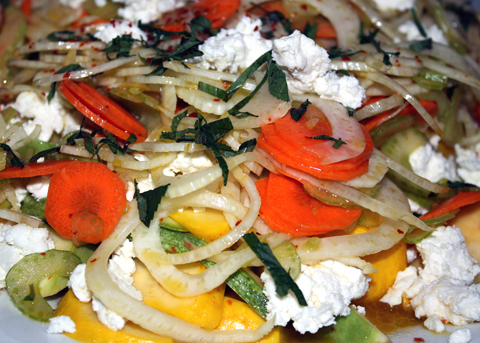 The chef does this, he says, because he finds that the peppers are more easily digested this way. 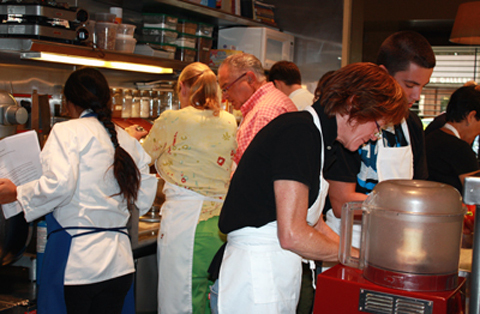 All through the kitchen, students worked at shucking corn; peeling tomatoes; blanching herbs; sauteing chanterelles; and slicing open large pork loins to fill with a spread of grainy mustard, anchovy, garlic, rosemary and thyme. Now and then in the close quarters, someone would call out “Behind you, behind you — hot, hot, hot!” as a simmering pot was ferried from the stove to a counter. There’s major heat generated in a professional kitchen when all the burners and ovens are turned up. So much so, that we all breathed a sigh of relief whenever we had to make a trip to the chilly walk-in to grab an ingredient. 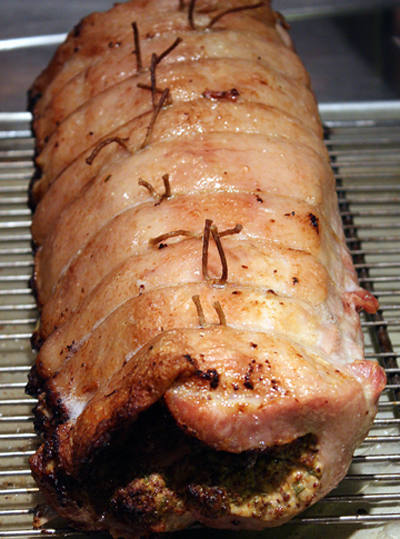 It wasn’t long before the aromas of roasting pork, toasted nuts, and sauteed garlic were making us very, very hungry. While the other students received printed recipes as guides, Carissa and I relied solely on the chef’s verbal instructions for the braised escargot dish. It’s a dish that the chef offers as a special at the restaurant only from time to time, because he knows not every diner is keen on snails. One taste of the tender mollusks, though, and you’ll be an instant fan. Cooking snails might sound intimidating, but this dish is as easy as it gets. Saute some chopped pancetta in a pan. After it crisps, strain out most of the oil. Return the pancetta to the pan, along with diced carrots, onion, and garlic. Next, add good-quality canned snails, already cooked, along with the court bouillon in the can. Simmer for a few minutes until the liquid is reduced. Add some minced fresh herbs such as thyme and rosemary, along with chopped anchovies, and a little chicken stock. 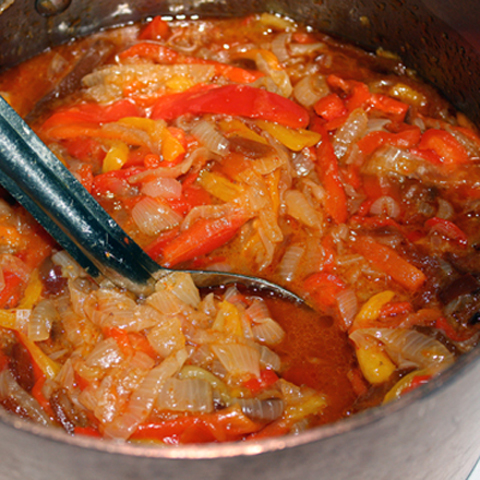 Simmer until the liquid is reduced again by at least 50 percent. Stir in toasted chopped walnuts. That’s it. 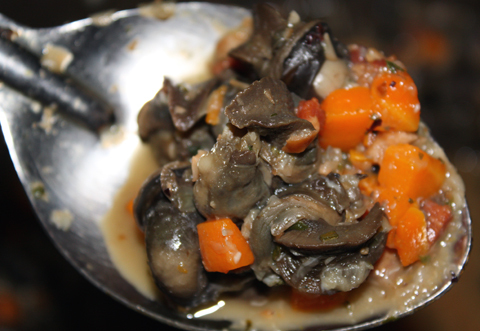 Serve this earthy stew of snails as is, or over pasta or gnocchi. As dishes were completed about 2 1/2 hours later, we brought them out to a large buffet table in the dining room. Bottles of wine were uncorked, as we all sat down to taste what we had created. We were amazed at the extent of the feast. We all had thought we would make a couple of dishes total, not this huge spread before us. 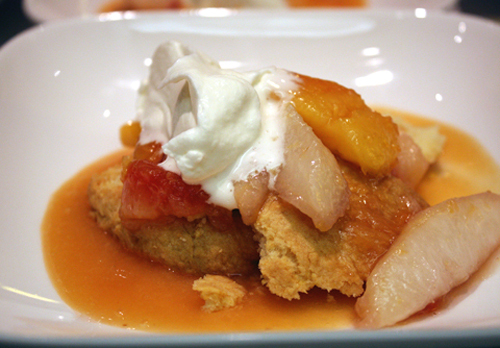 As we finished the last bites of light, buttery shortcakes topped with fresh stone fruit, whipped cream, and a sweet, thick peach coulis, we all felt in need of a long nap. The chef couldn’t provide that, but he did pass out take-out containers so we could pack up the leftovers to take home. If all the contented smiles and happily nourished tummies were any indication, he definitely succeeded. 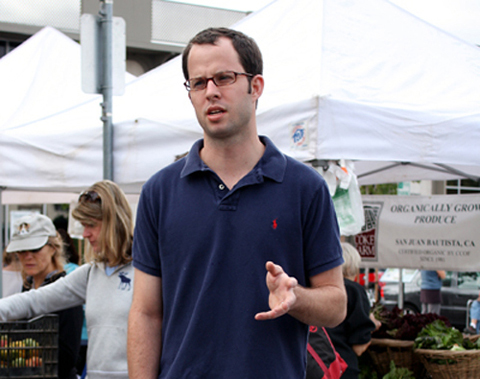 Marché’s next cooking class has not been scheduled yet. 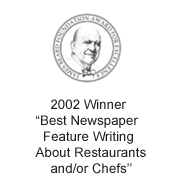 But to keep tabs on when it is offered, just sign up for the restaurant’s newsletter. 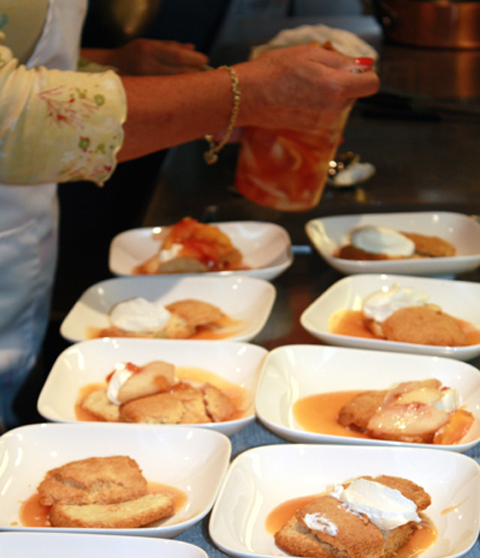 Meantime, enjoy these couple of recipes from the class I took. Since these recipes make enough to feed a good dozen or so people, feel free to cut them down if need be. Chef Bienaime brines his pork the night before, using a simple brine of sugar, salt and water. 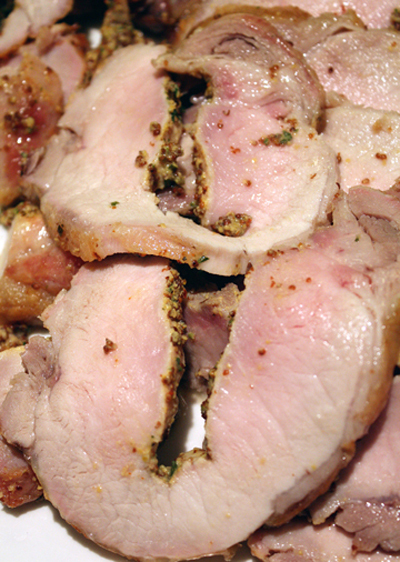 If you use a brine, rinse off the pork the next day, and pat dry, before cooking. Place whole pork rack on a cutting board, and cut through the length of the loin without going all the way through, opening it up like a book. Set aside. In a medium-size bowl, mix herbs, anchovy, and garlic into whole grain mustard. Season with espelette, and salt and pepper. 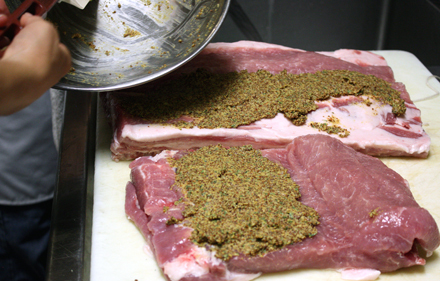 Rub this mixture inside of pork rack. Fold up pork rack, and tie with kitchen twine between each rib. Roast in oven until center reaches 130 degrees, approximately 1 1/2 hours. Let rest at least 5 minutes before slicing. This dish will surprise you. It has the texture and mouth-feel of polenta, but there is no cornmeal in it. 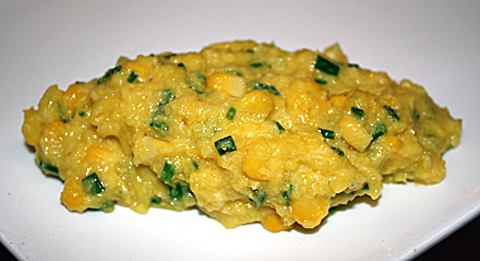 Its thick, creamy body results rom the natural sweet starch of the corn. It’s a spectacular dish in its simplicity. Shuck ears of corn. Cut kernels off cobs and set aside. Then “milk” the cobs over a bowl, pressing against them with the back of a knife. Add the resulting liquid to a medium-size pot along with the butter. Cook on medium heat for 10 minutes; stir in half of the reserved kernals. Then, carefully puree the mixture in a food processor or blender. Pour the mixture back into the pot, add remaining reserved kernels, and cook for another 10 minutes on medium-high heat. Fold in chives, and salt and pepper to taste. WOW, sounds like an incredible class! From picking the food, to preparing and eating it sounds like an experience you won’t forget! Thanks for sharing! Oh, to be able just to smell the wonder as the meal was prepared …! What a wonderful feast! Thanks for the polenta recipe. I’d love to give that a try. Oh, that looks like so much fun! Everything looked great, even the snails although I don’t know if I’d want to eat a lot of it. Saw too many garden snails back home! The tomato confit looks great, how is that done? 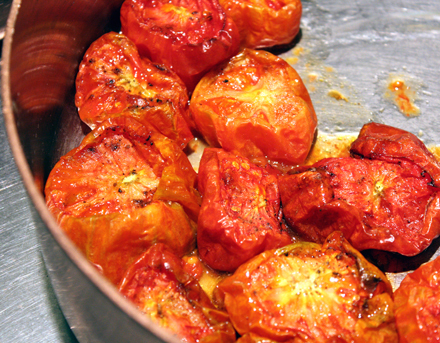 I saw tomato confit on lots of menus this summer and wondered how the prep is different than just roasting them? 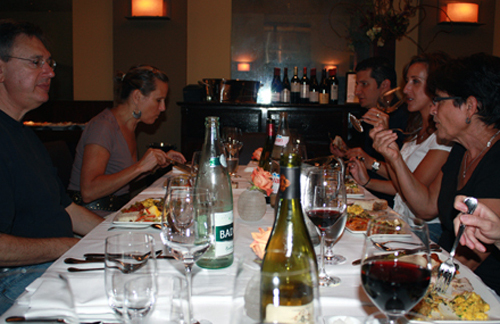 I’ve taken a similar class at Iberia in Menlo Park – emphasis on spanish tapas there, of course. Lots of fun! Andrea: There were quite a few couples in the class. So, yes, it’s ideal for a twosome. Judith: Thanks for the tip on Iberia. Tapas-making would be like a big ol’ party! What a great idea! Now THAT’S a cooking class! What a great experience and the roast pork looks & sounds really wonderful, perfect with the corn “polenta” ! That’s how a cooking class should be! Sounds like a lot of fun. The ‘polenta’ looks incredible. Wow, the food looks incredible and what a wonderful opportunity! I’d love to participate in this class, how fun! Sounds like a great class. I signed up for the newsletter so hopefully one day I’ll be able to take one of his classes.